Migrants from Central America walk to the United States in hopes of a better life, November 12. 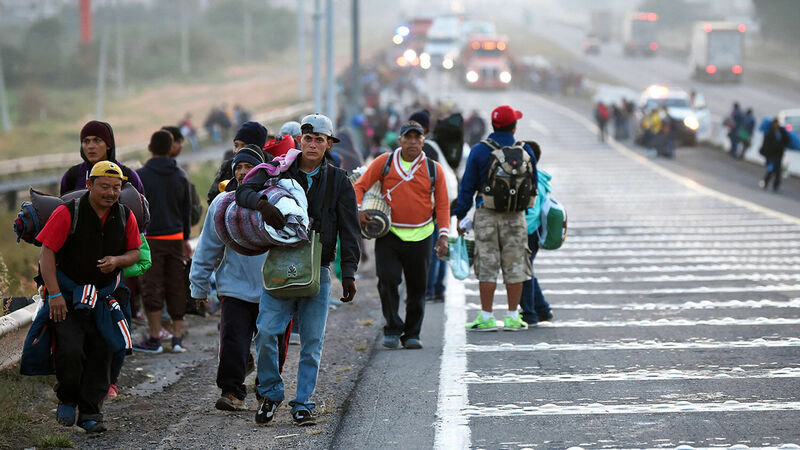 Armed militia groups and civilian vigilantes are headed to the United States–Mexico border to help stop an oncoming caravan of 6,000 Central American migrants from crossing the Rio Grande. According to Shannon McGauley, the president of the Texas Minutemen, roughly 100 militia volunteers are gathering tents, coolers, rifles and aerial drones with plans to form caravans of their own. President Donald Trump has deployed troops to the border. The militia members and other civilians heading for the border say they plan to follow the troops to observe, report and offer aid. Yet the U.S. military is not pleased with this unsolicited help. According to military planning documents obtained by Newsweek, the military estimates that there are already 200 unregulated armed militia members at the border in addition to the 100 Minutemen on their way. U.S. military officials say they are concerned that the presence of these civilians at the border may complicate their mission to enforce U.S. immigration laws. In Mexico, armed civilian militias have already risen up to defend their villages against drug cartels that the Mexican government seems powerless to stop. And in some instances, these Mexican militias have blocked military officers, federal police and all strangers from entering their villages. They have taken the law into their own hands. This has analysts worrying that Mexico may soon erupt into a three-way civil war between organized crime syndicates, civilian militias and government troops. While the murder and civil pandemonium of Mexico may seem remote to many Americans, the same drug cartels causing so much carnage south of the border are operating in the United States. If Americans lose faith in the government’s abilities to defend the nation’s borders, they could experience a similar three-way civil war between migrants, militias and the military. Open borders are an attack on the very basis of citizenship. As a condition for belonging to a nation, individuals promise to obey the nation’s laws and pay taxes in return for government protection. When people lose faith in police and armed forces to protect them, they take the law into their own hands, and anarchy results. This process is underway in Mexico and is starting in America. U.S. militias are not warring with illegal immigrants yet, but they are losing faith in the government and the military to defend the border. This is a harbinger of an age of coming anarchy. Almost 3,500 years ago, the Prophet Moses recorded God’s promise to bless Israel for obedience to His laws and to curse it for disobedience. Herbert W. Armstrong explained in his most popular book, The United States and Britain in Prophecy, that these promised blessings and prophesied curses apply primarily to the end-time descendants of ancient Israel: principally the United States and Britain. The reference to Israel’s “high and fenced walls” coming down is about open borders where foreigners and strangers flood into the land. Other scriptures, such as Isaiah 1:7, show that cities will burn with fire as the land is laid desolate and overthrown by strangers. Attempts by militia groups and civilian vigilantes to stop the fulfillment of this prophecy will be to no avail. God is bringing this prophecy to pass because the nations have failed to observe God’s commandments and statutes. Now is the time for every American to ask, What are we doing to bring such chastisement upon ourselves? God gave 10 basic laws to humanity on how to live. They are described in detail in our free booklet The Ten Commandments. This booklet explains the specific sins that have caused America to be cursed with open borders and the prospect of chaotic violence. It also shows the blessings that come from obeying God’s laws.